CANDACE RYAN is the author of RIBBIT RABBIT (2011) and MOO HOO (2012), both illustrated by Mike Lowery. When the word wrangling author learned about Madagascar's shy aye-aye lemur, she couldn't resist the chance to try her hand at match making. Candace lives in Los Angeles, California with her young son and a host of toy animals. Learn more about Candace at candaceryanbooks.com. STEPHANIE RUBLE loves drawing all kinds of animals-cows, elephants, bunnies, chickens but most notably, sheep and lemurs. In fact, she has been drawing and painting since she could hold a crayon. This native Minnesotan and comic strip lover currently resides in Brooklyn, New York with her husband. 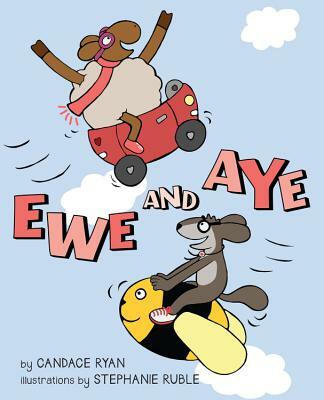 EWE AND AYE is her first picture book. Learn more about Stephanie at sruble.com.